With free iPhone cases abounding, an iffy economy, and a new truck project that's capable of taking every last dollar I can throw at it, why did I buy a $70 iPhone case? Because it's the one I've always wanted. Wood is the best material. It's second only to leather for how nice it feels in the hand—and even that's debatable. It is theoretically sustainable, assuaging the tortured consumer soul with eco-positive lubrication. And it's just pretty. While I've got nothing but respect for Dieter Rams, the legendary designer's influence over modern electronics has left us with a world of geometric shapes, cold metal, and monochromatic plastics. The age of wood panelling in electronics is long gone, wounded by a Braun-influenced Sony in the '80s and '90s, then felled with a finishing chop by Apple. If Henry David Thoreau walked into an Apple store this morning he'd be whimpering under the leaves of his mother's kitchen table by brunch. ...such as Grove, the Portland, Oregon company that makes iPhone cases from Moso bamboo—more often than not a sustainably harvested variety, although sometimes supplies of FSC certified wood are simply not available. I brought home a plain iPhone 4 case from Grove about a month ago. The company sells laser-engraved cases for just $20 more and they're legitimately lovely, unlike so many other "art" cases, but I thought I might do an original design of my own in the future, so I refrained. Nope, it's just plain wood with a medium finish for me, excepting the small Grove logo etched into the side. As far as iPhone cases go, it's fairly bulky. Not 'extra-built-in-battery' bulky, but it adds a good 5mm to each end in length, and perhaps 3mm to the sides and back. That's to be expected for wood, of course. Part of the reason it isn't used in modern electronics, especially those that are designed for pockets, is that it isn't as strong as plastic or steel. 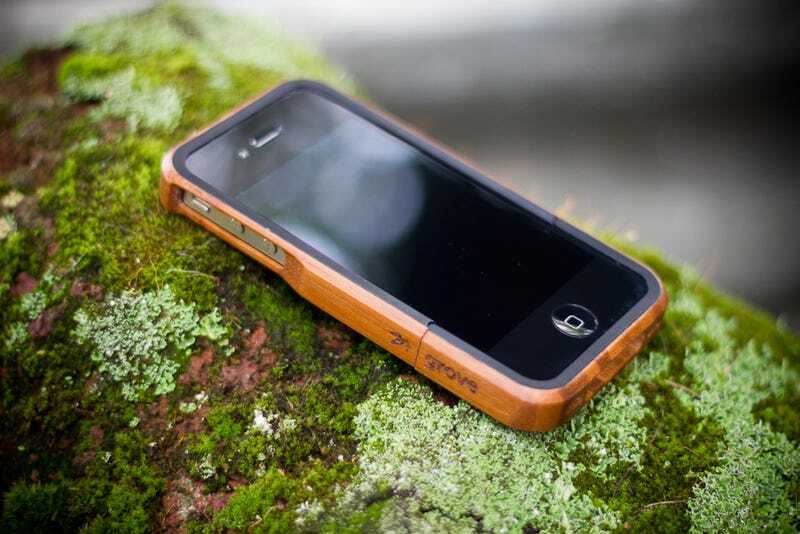 Because the wood adds a lip to the phone, many docks and accessories won't work with the Grove case on. (Your millimileage may vary.) And up top, the Grove case's depth brings back memories of the iPhone 1's recessed headphone jack. It's not as bad as that nearly forgotten misstep, but larger minijack plugs simply won't plug in without an adapter. Not a big issue for headphones—most have tremulously remained on a diet since the iPhone 1 scare—but for other audio plugs it can be an annoyance. Most damningly, the case in stock form has a tendency to...slip off. The Grove case is really two pieces which slip over the top and bottom to meet below the iPhone's waistline. They're held on by tension of the wood (which says a lot about the precision of the Grove case itself) and a soft black felt backing. But unlike plastic cases of similar design, the two pieces don't clip together. They just touch. And after a little less than a week, my Grove case wanted to start letting the relatively heavy iPhone 4 perilously slide out of the top part of the case—the part you hold. To be clear, this happened first the day after I had had my phone in the pocket of my motorcycle jacket while riding out to the Oregon coast. It's reasonable to think there was a good bit of vibration. But it's also reasonable to expect that the vibration only sped up a process that is inherent to the design. It was easy enough to fix. I folded a small piece of card stock and slipped it in between the felt and the phone. Snug enough to trust again. Let's ignore that I had to do the same thing to the bottom part of the case in a couple of weeks. But You're Still Suggesting I Buy This? Here's the thing: It's wood. It's not supposed to be perfect. And as far as the quality of the workmanship goes, I am seriously impressed. It feels about as thin and precise as a wooden case could be. I can't ask for more. Plus it's wood. Wood that feels better the more I hold my iPhone. Wood that has taken a couple of short falls and looked better as it has weather scuffs and scratches. Wood that's just pretty to look at, to turn idly in the hand.